Making a Zen garden is one way to create a meditative space in the yard. While some gardeners exploit color theory, taking advantage of the calming effect of "cool" colors, such as blue and lavender, you can achieve the same purpose with a more elaborate design for enjoying serenity in the backyard. A gardener who idolizes nature and who likes to interpret the world symbolically is a good candidate for Zen gardens. But lovers of low-maintenance landscaping should think twice before installing such a design. Zen gardens may look simple (which is part of their appeal), but they're a lot of work—both to make and to maintain. Nor is this style a great choice if most of your gardening fun comes from growing showy plants, which immediately disqualifies most of us (growing plants being almost synonymous with gardening for most people). Japan is a mountainous nation of islands jutting out of the ocean. This natural setting is awe-inspiring, and the Japanese people value the raw beauty of nature that surrounds them. It's this appreciation, in part, that accounts for their innovation of the Zen garden. Developed by Buddhist monks in ancient Japan (with some Chinese influence), Zen gardens are often dubbed "miniature landscapes" because their components symbolize aspects of nature. Most notably, the expanse of white gravel (which is easier to work with than sand) raked to have ripples represents ocean waves, and the tall, narrow boulders jutting out vertically represent mountains. Meanwhile, the shorter, more rounded rocks or the flat ones in the "sea of sand" represent islands. Plants, too, are part of nature and therefore have a place in the design, although their use is restrained by Western standards. But short, green plants may be grown on or around the "islands" to represent island vegetation, and architectural plants can serve as accents. Any short trees or shrubs that are included in the design must be pruned meticulously. In fact, shrub topiaries can be pruned in such a way that they represent islands (instead of using rocks for this purpose). Zen gardens can be characterized in a number of different ways. Because of their stark, artistic quality, they're quite abstract when compared to, say, English cottage gardens. Along the same lines, they can be considered minimalistic. Their symbolic use of raked gravel to represent water leads to the characterization of being "dry landscapes." Their heavy reliance on rocks leads some to refer to them as "Japanese rock gardens," although the intent (meditation) behind making them differs from that behind other rock gardens. Since Zen garden design evolved over the course of centuries, it's pointless to try to ascertain a single "authentic" set of components for it. 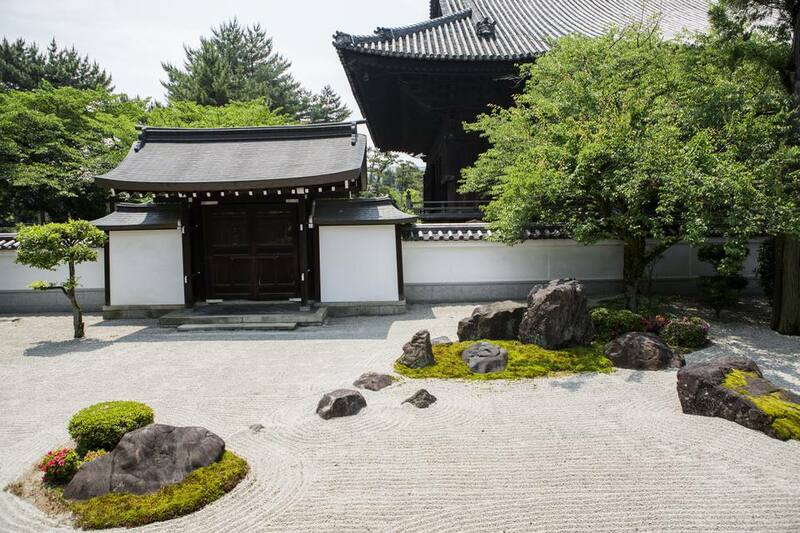 Most gardeners interested in the topic who live in lands far away from the far East are content to incorporate enough of its classic components in their construction to suggest a true Zen garden. Select a flat area in your backyard, and mark out a rectangular portion of it. Size can vary; on a small property, a 12 foot by 18 foot rectangle may be appropriate. You can reduce your workload (which is significant) by settling for a smaller space. If you'll be growing plants in your Zen garden, their sunlight requirements factor into your site selection, so decide ahead of time whether you will be growing sun-loving or shade-loving plants and locate your meditative space accordingly. The traditional Zen garden was a walled-in space. The seclusion thus attained was conducive to meditation. For most homeowners, building a masonry wall for a meditative space in the backyard is either undesirable or unaffordable. Substitute a lattice fence to achieve inexpensive privacy. Consider this a separate project, to be undertaken before you make the Zen garden (but include a wide gate to make it easy to bring supplies inside). Clear the selected rectangular space completely of anything sticking up out of the ground (plants, weeds, stones, etc.). With a shovel, remove the top layer (a few inches) of the existing soil. Check for level by pounding stakes into the ground end-to-end (both lengthwise and widthwise within your rectangle), tying string between them, and making use of your string level. Using the steel garden rake, rake out uneven spots. Run stone edging along the lattice fence. Cobblestone is a good choice. This edging will retain the white gravel. Dig holes for the rocks you'll be using to represent mountains and/or islands. Arrangement is subjective, but, for some guidance, consider how these features occur in nature and arrange the rocks accordingly (definitely not in symmetrical patterns, circles, straight lines, etc.). Also, dig holes for any plants you'll be installing. Install the rocks and plants in their holes. Much of the length of those tall, narrow rocks (representing mountains) should be buried. This tip-of-the-iceberg placement will make them look more natural. Lay landscape fabric over the soil, making cuts to accommodate rocks and plants. Apply a few inches of the white gravel. Spread it with the hoe to distribute it. Rake ripples or swirls in it with the wooden Zen rake. Part of Zen-garden maintenance is to rake these designs back into the gravel after the elements have disturbed them. What's a Cut and Come Again Garden?